Over the weekend, my grandma EG and Aunt Wendy flew in from Texas to meet Tenley and spoil me. They bought us presents, snuggled my babe, helped me run errands and babysat for us while JD and I went on our first date sans baby. I was so grateful they made the trip and felt super loved during their stay. Before my mom left, we took some pictures of the four generations. Tenley wasn't being super agreeable that day and is screaming in most of them. . . major bummer. But! One decent picture is all you need, right?! I love these ladies. 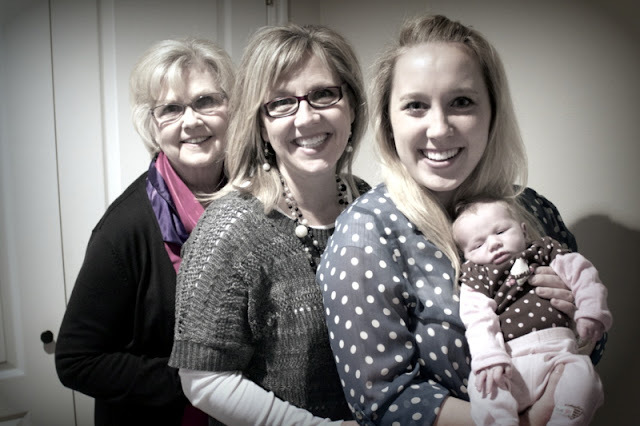 I am grateful for their examples, their love, and their commitment to motherhood. I feel an overwhelming sense of duty as I move forward as a mother. . . to continue building on their legacy of faith, kindness, and cheerfulness. I want to be happy like they are. I want to teach my children to think of others, to serve willingly, and to uplift those around them. Essentially, I just want to be like them. Sweet Tenley girl, I promise to do my best! Love the generations photo, such a sweet thing!